Segregation is one of our nation’s most enduring and intractable problems. More than 60 years since the Supreme Court’s landmark Brown v. Board of Education decision denounced racial segregation in primary and secondary public schools, and 50 years since the enactment of the federal Fair Housing Act, our neighborhoods and schools have yet to reflect the rich diversity of our nation as a whole. Given the seriousness of the problem of racial segregation as a cause of racial inequality and the complexities in understanding the nature of this problem, the Haas Institute is launching a series of briefs that will attempt to illuminate these patterns and demystify the reality of segregation in the San Francisco Bay Area. 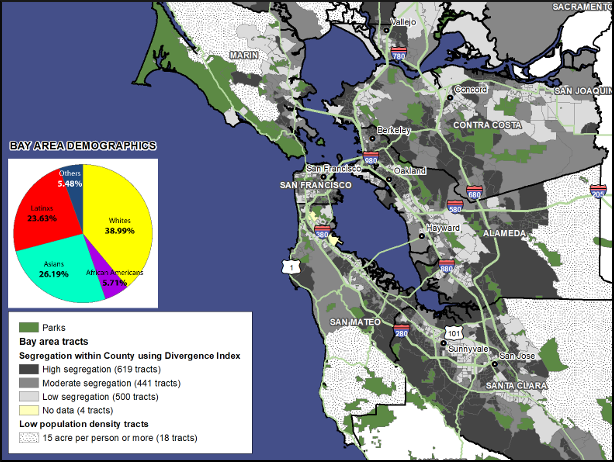 In the first brief, we present a series of detailed maps illustrating segregation across the region, within each of the nine Bay Area counties, and in its major metropolitan areas. Our goal is that readers in the Bay Area, for the first time, will have a clear portrait of the reality and extent of the racial segregation in their communities. We highlight and discuss the varying levels of residential racial segregation within the region and show which communities and neighborhoods are the most segregated, and the most integrated. In our second brief we disaggregate and untangle patterns of segregation into specific patterns of racial demographics. 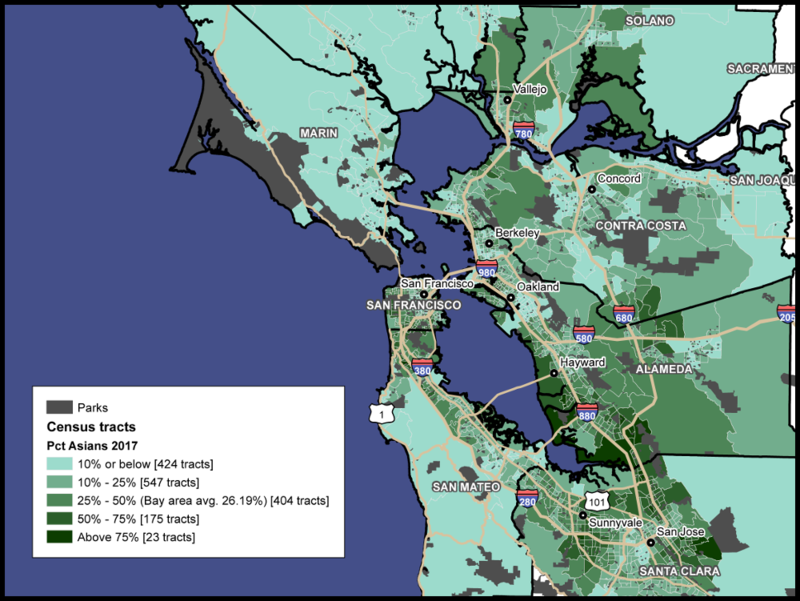 We examine the unique patterns of racial distribution in the San Francisco Bay region, and across major metropolitan areas. In particular, part two of this series illustrates the distribution of white, Black, Latino, Asian, and Native American populations across each large metropolitan area and many counties. We also examine specific areas of racial clustering and concentration, not simply segregation, and examine how these demographic changes have occurred over time. This page will updated as new briefs in the series are developed.